Welcome. Mike Guillory design & illustration specializes in design, illustration and original art for purchase in print form. I’m a Houston illustrator and designer. For over 46 years I’ve offered the best in Houston illustration and design services for projects that include annual reports, brochures and collateral materials, advertising, corporate identity and web site design. I have worked for clients in the past that have offices all over the United States and Mexico. To name a few, I have had original works commissioned from such clients as American Airlines, American Express, SYSCO Foods, Brinker International, Fulbright & Jaworski, Pennzoil, Service Corporation International, Stewart Title, CBRE, Oceaneering International, Baker Hughes, Cambridge Healthcare Properties, and Bright Sky Press Publishing. If you are looking for illustration or design services, contact me. Browse the gallery to view the selection of original fine art prints that are currently offered for sale. Unlike litho reproductions on commercial printing paper that will fade over time, these high-quality fine art giclee prints will last a lifetime. 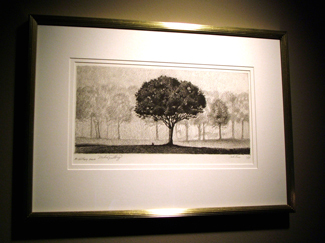 Giclee prints are reproduced on archival acid-free watercolor paper or canvas with inks that will last over 100 years. Fine art giclees make wonderful timeless gifts that can help create any mood in an interior setting. 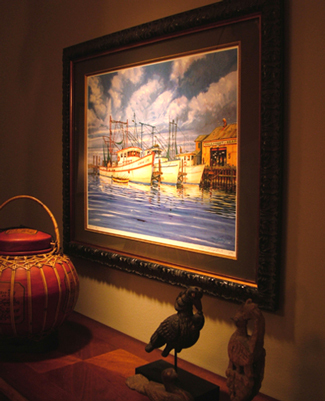 Fine art giclees can enhance any décor. All are unique and original art prints. These unique art prints include a wide array of subject matter and a variation of mediums on the originals that include watercolors, dyes, Prismacolor pencils, acrylics, pen and ink, and whatever else it takes. Most of my originals are mixed media. All art prints on watercolor paper are hand-signed and numbered in limited quantities to ensure exclusivity. Subjects offered at present are wildlife prints, animal prints, dockside prints, waterscapes, lifestyle, history, and still life with many more works to come. Please visit this site often as new subjects are added regularly. If you would like to contact me with suggestions on new subjects for my original fine art prints, please feel free to do so. My web address is www.mikeguillory.com or my email address is mg@mikeguillory.com. Perhaps I’ll do something that will suite your taste. I hope you enjoy the fine art prints you see so far. Thank you and come back soon! Copyright © 2010 - Mike Guillory. All Rights Reserved. presented in this web site.